Myer is Australia's largest department store group, synonymous with style and fashion for over 100 years. Myer is a Melbourne icon and one of the oldest shopping retailers in Australia. A market leader in Australian retailing, Myer continually strives to better serve customers and their changing needs. 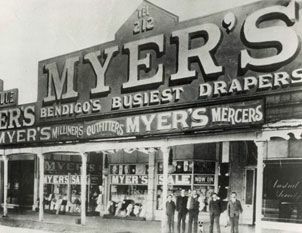 Sidney Myer arrived in Melbourne in 1899 as a penniless Russian immigrant and ended up creating one of the largest retail businesses in Australia. He and his brother worked briefly at a drapery store in Flinders Lane before moving to Bendigo where they opened the first Myer store in 1900. They continued to prosper and opened another Myer store in 1908. In 1911 Sidney bought a drapery store in Bourke St, Melbourne. After buying up a number of the adjoining properties he built a department store on the site called Myer Emporium. After establishing himself in Melbourne, Sidney expanded the business setting up in Adelaide and later across Australia. In 1920 he married Merlyn Baillieu, the 22 year old daughter of an established Queenscliff family. Not only did Sidney Myer achieve great business success, he also became a leading philanthropist. In 1989, Myer joined with Grace Bros to become the largest department store group in Australia. Since 1956 the Myer Christmas Windows have been a feature of Melbourne life and delighted generations of children. Thousands queue to view the windows each year, a highlight of Christmas in Melbourne. Myer's gift to the people of Melbourne, the Myer Christmas windows are a local tradition that has reached legendary proportions. Every year since 1956, the windows have featured a specially - themed display during the festive season featuring famous fairy tales, children's stories as well as key historical milestones.